The vented and drained cavity formed by the Panel can be used for applications other than EIFS. Masonry veneer. Many types of stone used for veneer make construction of an unobstructed cavity behind the veneer difficult. The usual solution is to use a rigid fibrous panel to fill the cavity and support the veneer until the mortar has set. Another solution is to place pieces of rigid plastic foam insulation intermittently in the cavity, to be removed after the mortar has set. Neither solution is entirely satisfactory. Detail all penetrations, from windows to hose bibs, to be sure that they won’t admit water into the EIFS, or worse, into the sheathing and wall behind. Provide soft joints where transitions in the substrate or joints in the substrate may cause movement, either in plane (structural expansion joints, floor deflection), or perpendicular to the wall plane (differential lateral deflection of framing). Use two-stage joints with outer seal of low-modulus sealant, adhered to base coat, a drained and vented joint cavity, and an inner seal of low-modulus sealant, flexible membrane, or expanding acrylic-impregnated foam sealant. EIFS-to-EIFS joints have limited capacity for movement, even with low-modulus sealant. The limit might be as little as 5 mm, depending on the modulus of the sealant, and other parameters.1 For larger movements, use a metal expansion joint. Place soft joints either at corners of openings, or well away from them. Insulate outside the air barrier. Insulation inside the stud space is roughly 50% less effective because of thermal bridging by the framing. It may also cause condensation, corrosion, and mold when interior moisture condenses on cold sheathing between studs. Consider possible impact damage — proximity to grade, vandalism, use of swing stages, window washing, and adjacent sidewalks, driveways and loading docks are all factors. Consider potential for fading, overheating, and overcooling if dark colours are used. Don’t use EIFS for window sills, tops of parapets, or other upward-facing surfaces. Drain other building surfaces so they won’t discharge water onto EIFS. Don’t let snow accumulate against EIFS. Provide drips at outer edges of downward-facing horizontal surfaces. These points are highlights. Successful installations of EIFS require knowledge, skill, and dedication. Even if you intend to rely on other participants, consider reading the ASTM special technical publications on the subject in addition to consulting industry publications and representatives. Flashing at the bottom of each cavity, to intercept water, drain it to the exterior, and drip it free of the surface. A membrane barrier applied to the substrate that is waterproof, airtight, and vapour resistant. (In some cases, with masonry backup for instance, a designer could opt to locate some of these functions elsewhere.) Vents at the flashing locations, to allow air to enter for ventilation and pressure-moderation. Sheltered vents at other locations, designed to prevent entry of water, if maximum ventilation and a drain screen are intended. Cavity closures at locations other than intended vents to the exterior — at window jambs and sills, for example. 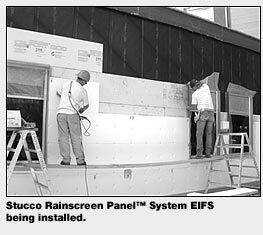 The Stucco RainScreen Panel™ is a new product that has seen limited application to date. As with any new product, there may be unanticipated problems. However, it promises to eliminate the main weakness of EIFS “drainage” systems and should see wider application in the future. To date, no EIFS manufacturer has embraced the Panel as part of their system, but if initial installations are successful this may change. Installations to date have not encountered problems in construction, but have no long term service history. Lack of encouragement from major EIFS manufacturers has not deterred designers who see advantages in the system. The Panels are not just prospective components of EIFS systems. They can also provide pressure-moderated, drained cavities in systems with other cladding. Korax offers a simple alternative to multiple layers of building papers with treated wood strapping for climates where rain penetration is a problem with stucco, for instance. Other applications are not difficult to imagine. 1 Williams, Mark F. & Lampo, Richard G.,“Development, Use, and Performance of Exterior Insulation and Finish Systems (EIFS)”, ASTM STP 1187, Philadelphia, 1995.